This was shared at the office, and I wrote in the e-mail chain, “I can never tell 3 and 4 apart.” 3 and 4 are the twin sisters who do the bop-the-head-to-the-side dance. Then one of my coworkers said, “I really like this dude,” and he attached a picture of 5. He didn’t know it was 5, and I wrote back and said, “Oh, that’s 5, the brother of twin sisters 3 and 4.” To which he wrote back, “I bet you knew that wihout looking it up on Wikipedia.” And yes, I did know that without looking it up on Wikipedia. And then led me to consider how the Peanuts cast changed over the years. There are characters in A Charlie Brown Christmas who were in their declining years (like Shermy), who never really had a role (3, 4, and 5), or who were still to peak before vanishing (like Frieda of the naturally curly hair). 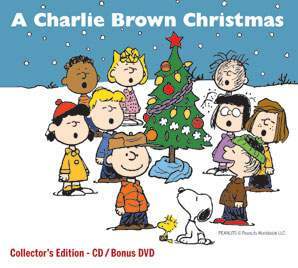 A few years ago, Starbucks issued a special CD/DVD package of A Charlie Brown Christmas (which I wrote about at the time here), and one of the things I noted is that the cover artwork features a lot of characters who simply didn’t appear in the special. Peppermint Patty, Marcie, Franklin, and Woodstock were are yet to debut in Peanuts, while characters who did appear in the special are nowhere to be found. It does make sense why some characters would be featured and not others, though. The casual fan doesn’t know who Shermy is (some people think of him as “Taller Linus“), but they do know Peppermint Patty. When they see Snoopy, they expect to see Woodstock. And no one, absolutely no one, will care when they sit down to watch A Charlie Brown Christmas, that Franklin and Marcie are nowhere to be found. The spirit of the story’s ending is maintained in the cover art — all of Charlie Brown’s friends gathered around the tree that just needed a little love — even if the actuality of the ending is something different.